Here we are again. The end of another successful movie month, and I wanted to go out with a big one - so I did. Today's movie is the nearly 3-hour science fiction epic - from 2014 - Interstellar. I really like Christopher Nolan films. They're usually big. They're usually long. They're usually some level of confusing. A lot of the time they start with the letters "In" and more than once they've consisted of a man dressing up as a large, black, bat. Out of the nine features he's directed, I've seen all but the first one. The only one I've seen in the theater, besides The Dark Knight Trilogy, is Inception. At the time, I loved it and wanted to see it again as soon as possible. I have yet to watch it since then, but that doesn't change my opinion of the movie. I like movies that strive to make you think, to complicate things, to confuse and leave things mysterious. Movies where you CAN'T turn your brain off. 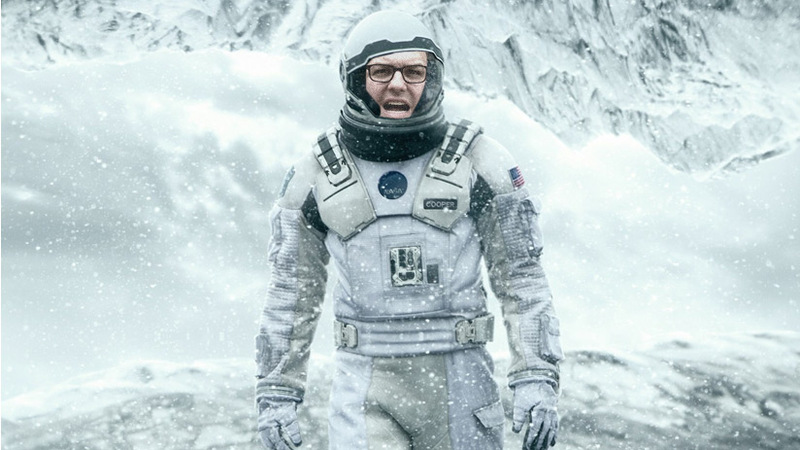 So guess what - I really really liked Interstellar. It's the story of a small time farmer played by Matthew McConaughey who is actually more than he seems. The world has changed. There is no more military. The world's pilots and engineers are better off served as farmers - trying to solve the problem of the lessening crops due to dust storms and blight. After an anomaly occurs, providing McConaughey and his daughter a set of coordinates, he stumbles upon an old base that turns out to be the secret home of NASA. It turns out the world is dying, and NASA has been searching for a new one. And now, there is another team of astronauts ready to go on a dangerous adventure across space and time. Hey Matthew McConaughey, wanna fly the rocket? For an almost three hour movie, I thought they got to McConaughey discovering NASA still exists, to NASA wanting him to fly, to him saying goodbye to his kids, to the rocket taking off, rather quickly. They show that he is super smart, and we can assume he was a great pilot, but I guess I would've liked to see some sort of transition or training - maybe a little push back from the people who have been working on this - to have this guy just come in and become the pilot so fast...I guess they really felt like he was chosen based on the anomaly that brought him and NASA together. The rest of this will probably be spoilery - so feel free to bail here. This is where the movie really takes off...Oh man what a terrible choice of words. But it does. Now we have to see a father leave behind his children for what might be years - all for the shot of maybe saving their lives - and the lives of all humans. That's plan A. Find a planet that can humans can live on - get them there in the giant space station that the NASA base actually is. Plan B is - they take hundred of frozen embryos with them. If plan A can't happen and Earth and all its inhabitants are doomed, at least the human race still has a chance by creating a colony. Their big hope likes in a black hole that they plan to travel through to a solar system too far away for them to find on their own. That trek alone takes months and requires the crew to sleep through most of it. Oh the crew? Right. Besides McConaughey, there as Wes Bentley (most known from American Beauty and more recently from American Horror Story), David Gyasi (who I have apparently seen in things but do not know him from anything), and Anne Hathaway (most known from being a very famous actress, a very good actress, and someone who can be excruciatingly annoying). I love when they go through the black hole (or was it a worm hole? or is that the same thing?) and come out on the other side to the unknown. There are three planets that previous expeditions have ventured for in this new solar system. The first planet is so close to another black hole, that time works differently on the surface. Every hour that passes down there is like 7 years outside of it. Of course we know that McConaughey and Hathaway have to be the last two survivors of this crew right? Sure those other guys are perfectly nice, but they might as well be wearing red shirts. To avoid too much lost time, they plan to jump down to the planet, check out what the issue is, and leave with any survivors. Of course things don't go quite right. The planet is covered in a lot of water, and being so close to the black hole, the gravitational pull makes for gigantic tidal waves. It turns out the original crew is dead. They probably only died a couple hours ago according to time on this planet, but it's been years in Earth time. They get caught up in a wave, which makes their ship too water logged and useless for a couple hours, but also kills off Wes Bentley's character. See you back next year on American Horror Story: Hotel. When they finally do escape the planet and get back to their fourth crew member - 23 years have passed by. The one crew member that stayed behind was alone. For 23 years. It's at this point I feel like I am doing a book report. Do I really want to just rehash the entire plot of this movie? I probably could - but why would you want to hear it from me instead of see it for yourself? This post is long enough already - but then again this movie was damn long too. Not too long. Just long. I loved the cameo of the surviving doctor on the second planet they visited. I have no idea at all that Matt Damon was in this movie. I also had no idea that John Lithgow, Casey Affleck, or Topher Grace (where he been? seeing him was almost a bigger surprise than Matt Damon) were in this so they were all nice surprises. Michael Caine was no surprise - Christopher Nolan loves him - and I love whenever he's on screen. Just wanted to give him a quick shout out. I also love that they never really gave us a year. We don't know if this was supposed to be an alternative modern day or the distant future. I think the filmmakers did drop a hint though. When John Lithgow's character was talking about how people were all into their gadgets when the was a kid. I think that was a clue saying that John Lithgow's character was a kid around this current time. So I'm going to guess that this movie probably takes place around 60 years from present time. The reveal of this movie, it is a Christopher Nolan movie afterall, is a little confusing. That the anomaly that brought McConaughey to NASA was actually a future McConaughey communicating with his past daughter/self. The way he was able to communicate was through this cool time looking thing that was built by - even futurier people? Okay that took some brain bending a bit. And it brought up the question that if future McConaughey wanted his previous self to "STAY" then why did he send the message that resulted him in going in the first place? Could it be that simple sense of hope that he might still be able to save them all? It ultimately lead to a pretty sad and satisfying ending. Sad because he does miss his childrens' childhood, but satisfying that his daughter lived a full and happy life with lots of family. Satisfying because she was able to make plan A work and get humanity on a giant space station. And satisfying because Anne Hathaway is out there, on a habitable planet and McConaughey was going to find her - and I hope guide the space station that humanity was living on to this planet. Well, my plan A is done. It took 30 days, a lot of hours blogging, and even more hours sitting and watching. But I am done.